Scene from a 1970s science-fiction film: A blinding light descends on an American farmhouse. As the livestock start to panic, a farmer and his wife investigate the mysterious light in a field near their house. Soon, four military men join them, each seemingly more on edge than the last. “I don’t see any hammer and sickle, do you, colonel?” one says. “Maybe it’s on the inside,” the colonel replies. A few minutes later, the general tells the farmers, “Wipe it out of your mind, do you understand? You’ve seen nothing and heard nothing.” Then he has his men take their names for future interrogation. As the action unfolds, the forces of the U.S. government are treated as clownish at best. At worst, they’re secretive in a way that’s in no one’s best interests, forcing the hero to deceive, undermine, and oppose them as he works for the greater good. The film? 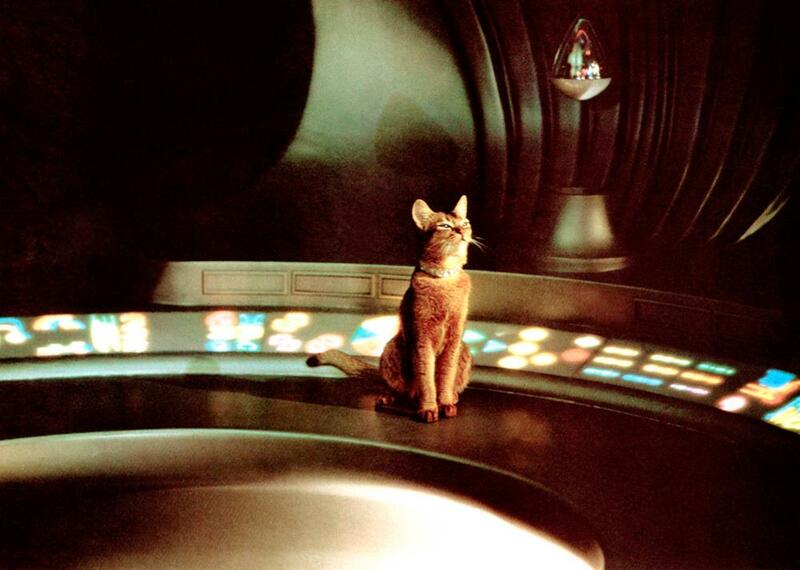 The Cat From Outer Space, a 1978 live-action Disney movie starring Ken Berry and Sandy Duncan. Such was the state of things by the late 1970s that portraying the government as a shadowy, conspiratorial, possibly actively malicious entity raised no eyebrows. In a short review, Variety patted the film on the head: “The fun, as usual with Disney pix, comes in the believable sight gags.” “Naturally, the Pentagon wants the cat,” The New York Times noted in passing. While that piece refers to “the unquestionably villainous figure” of Mr. Olympus (William Prince) a Blofeld-like schemer who serves as the film’s primary antagonist, it leaves the Pentagon’s villainy unaddressed. The Cat From Outer Space wasn’t the product of a bunch of subversives wanting to instill distrust in young viewers. Writer Ted Key created the comic strip Hazel and the characters of Mr. Peabody and Sherman, and wrote other Disney live-action movies such as The Million Dollar Duck (about a duck who lays golden eggs) and Gus (about a mule with an uncanny knack for kicking footballs). Director Norman Tokar had a long history with Disney that included live-action films like The Happiest Millionaire and The Apple Dumpling Gang. The stars included a lot of TV-familiar faces such as Berry, Duncan, Roddy McDowall, Harry Morgan, and McLean Stevenson. (The film doesn’t do much with the casting of M*A*S*H’s two commanding officers in one film.) What’s remarkable is how unremarkable this depiction was. The notion that the government had something to hide, and that the populace was never going to get the real story, had become the new normal in the years since Vietnam, the assassinations of the 1960s, the accompanying conspiracy theories, and the Watergate scandal. All these events seemed to confirm Americans’ worst fears, even for people who wanted to dismiss such theorizing as paranoia. Berry plays Frank Wilson, a government scientist who befriends Zunar-J-5/9 Doric-4-7, a.k.a. “Jake,” the titular cat from outer space, who’s stranded on Earth but able to communicate telepathically (in the voice of veteran comic actor Ronnie Schell) thanks to a high-tech collar from his home planet. (The collar also lets Jake move objects with his mind, leading to a lot of family-friendly physical comedy.) After Jake explains that he needs to return home, Frank is on the case, never questioning whether the cat could have some sort of ulterior motive, or considering whether he should turn it over to the authorities. True, that would turn The Cat From Outer Space into a much grimmer film. After all, if you can’t trust an adorable cat—from outer space or elsewhere—who can you trust? But it’s hard to imagine the movie taking the same form even a decade earlier. The distrust between the government and the governed had opened up a space so wide that even movies for kids were falling into it. A decade earlier, it also probably wouldn’t have involved outer space at all. As The New York Times’ review noted, “In Disney movies of another era, the collar would simply have been described as magical, like Cinderella’s glass slipper. Nowadays it is necessary to say that the collar focuses highly developed telepathic powers.” But after Star Wars and Close Encounters Of The Third Kind, space was the place. And while it took another year for the full deluge of science-fiction projects kicked into high gear by those films’ twin success to hit theaters, their influence was already starting to be felt, with much of The Cat From Outer Space playing like a goof on Close Encounters in particular. Producer Michael Phillips remembers Steven Spielberg’s Close Encounters pitch being “about UFOs and Watergate. This was actually nothing like how Close Encounters turned out to be.” That’s only half-accurate. While the film’s government forces turn out to be benevolent, welcoming the alien visitors with a message of peace and a party of earthly ambassadors, they’re also secretive, hiding the existence of UFOs from the world, doing little to help those who’ve lost loved ones to abductions, and faking an anthrax outbreak to clear the area around the aliens’ landing site. Spielberg portrays them as unsmiling men in uniforms with little regard for other people’s rights, which became the default depiction of government agents through today. 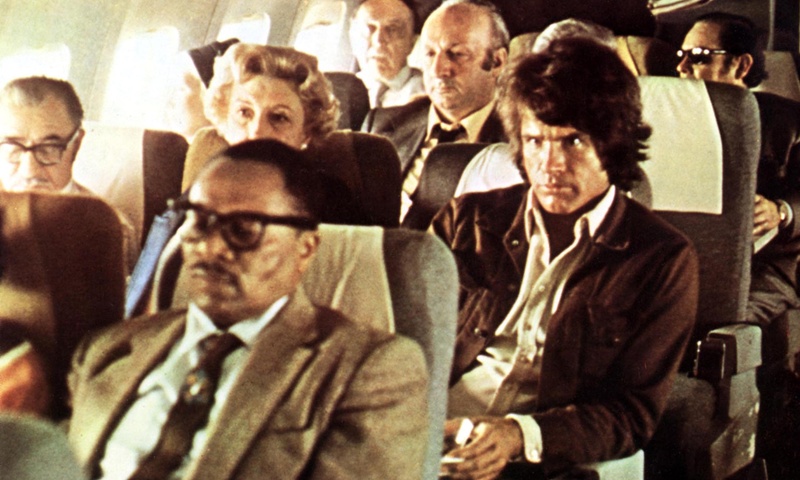 That depiction, born of a deeply ingrained distrust, manifested in a string of conspiracy-themed thrillers in the 1970s—at least one ripped from the headlines of the day. Director Alan J. Pakula had a particular knack for channeling the paranoia of the times, and in 1976, he won great acclaim with All The President’s Men, an adaptation of Bob Woodward and Carl Bernstein’s book about exposing Watergate that recast the events as a tense suspense film, while still keeping it firmly in the realm of non-fiction. Two years earlier, Pakula helped define the paranoid thriller, and push it to the edge of science fiction, with The Parallax View, which blew the conspiracy theories surrounding the many assassinations of the 1960s up to a global scale. Working from a script by David Giler, Lorenzo Semple, Jr., and an uncredited Robert Towne that adapted a 1970 Loren Singer bestseller, Pakula creates a world in which no one can be trusted, and nothing happens by accident. Warren Beatty stars as Joseph Frady, a recovering alcoholic reporter with a questionable reputation. In the film’s opening scene, Frady tries, but fails, to attend a 4th Of July speech delivered by popular maverick senator Charles Carroll (Bill Joyce) atop Seattle’s Space Needle. He’s shut out of attending, and thus misses witnessing Carroll’s assassination, which occurs shortly after he notes he loves Independence Day, even though others think he’s “sometimes too independent for my own good.” A few years later, Frady gets an unexpected visit from Lee Carter (Paula Prentiss), who says she’s afraid that she, like so many witnesses to the assassination, will soon turn up dead. Cut to Frady identifying her body at the morgue. Part of what makes The Parallax View so unnerving is that it also offers no explanation. The government often ends up doing the bidding of the Parallax Corporation—the film is bookended with scenes of a Warren Commission-like committee waving away conspiracy theories—but it’s clearly subject to Parallax’s machinations as well, and the company’s motives remain unclear, while its brilliance and pitilessness don’t. Pakula makes murkiness part of every aspect of the film, particularly its look. Working with cinematographer Gordon Willis—his collaborator on the equally paranoid Klute and later All The President’s Men—Pakula cloaks many shots in shadow, letting blackness eat up much of the frame, and sometimes not even fully illuminating his actors’ faces. There’s no fighting the creeping darkness. The paranoid thriller is an expanding genre in movies and popular fiction. The idea is to start from a thinly fictionalized version of a political tragedy like one of the Kennedy assassinations and build on it a thickly embroidered explanation that caters to the suspicion that such murders are plotted by a malevolent Establishment. It is apparently comforting for many people to believe that the course of the world is changed more by rational planning, however evil, than it is by irrational individual actions. There’s something to that, sure. Yet what falls apart as legitimate theorizing—as conspiracy theories almost invariably do—works wonderfully as a metaphor for a creeping sense of helplessness and distrust only reinforced by the revelation of actual conspiracies. What’s left to believe in if those in authority can no longer be trusted? And could even good news mask a hidden agenda? Released in June 1978, Capricorn One almost plays like an attempt to make good on Spielberg’s promise of Watergate as science fiction. In fact, a Starlog preview appeared with the headline “A Watergate in space.” Its roots go back to even older whispers of government deception, namely the theory that NASA faked the 1969 moon landing, which had circulated for years. Capricorn One takes the moon landing at face value, but imagines a faked Mars landing, required to save face when NASA realizes it’s doomed to fail. Written and directed by Peter Hyams, the film features an only-in-1978 cast: Elliott Gould and Karen Black play the cynical reporters Robert Caulfield and Judy Drinkwater. 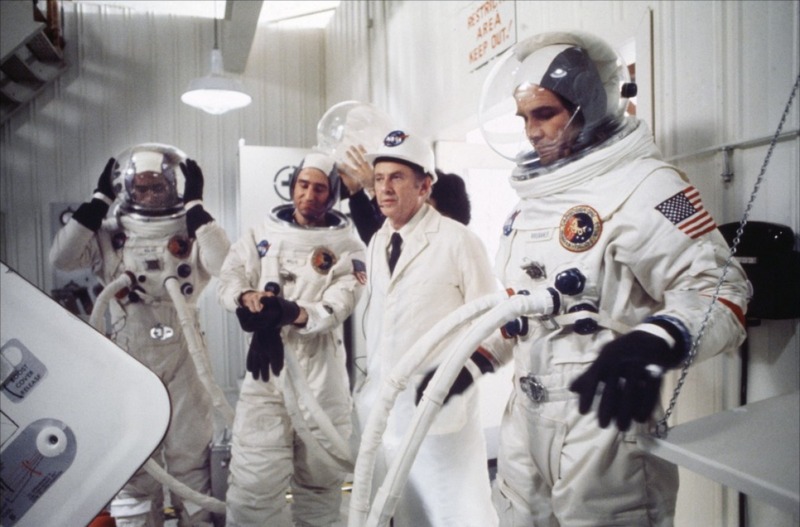 The Mars landing crew is played by James Brolin (as Col. Brubaker), Sam Waterston (as Lt. Col. Willis) and O.J. Simpson (as Commander Walker). Finally, Hal Holbrook plays Dr. James Kelloway, the mastermind behind the conspiracy. He’s prone to making windy speeches about why it’s in America’s best interest that the country thinks it’s landed on Mars, even though the historic event unfolded on a soundstage. 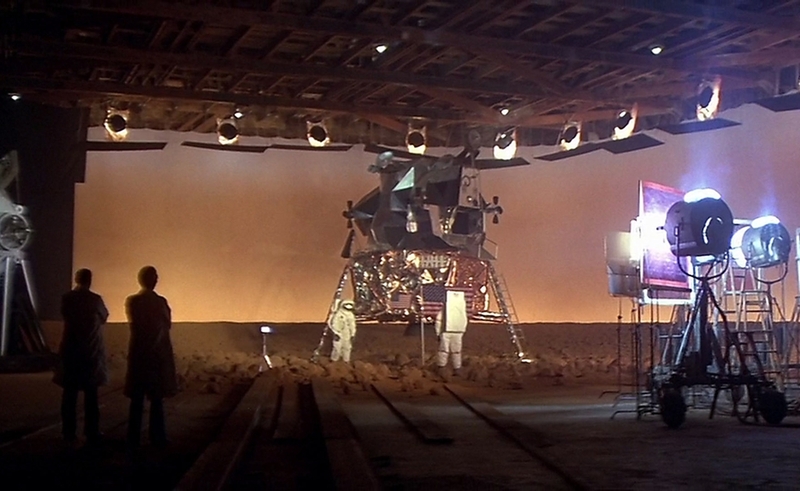 Capricorn One is a dumb movie made by smart people. Hyams conceived the idea as a reporter for CBS, a job he’d later claim got him thinking about how easy it would be to foist an untrue story on an unsuspecting public. Little in Capricorn One suggests that’s true, however. A subplot involves an engineer—and friend of Caulfield’s—who notices a discrepancy in the signals he’s receiving from the Mars mission, which only raises the question of how many people would need to be fooled, or brought into the conspiracy, for it to work. Yet the best parts of the film are those that treat the faking of the landing as a horrific breach of ethics. Hyams invests a sense of horror in the long pan back from what appears to be a lander on the surface of Mars, but that reveals the set and cameras used to fake the landing. The shot suggests the awfulness of learning one of humanity’s greatest achievements was really just a cruel joke. There’s a sadness to the moment that the film around it never attempts to develop. In fact, all the high-concept ideas end up as window dressing for a pretty standard thriller that puts the would-be astronauts on the run in the desert, and climaxes with an aerial duel between state-of-the-art military helicopters and an antique biplane, flown by a wisecracking crop-duster played by Telly Savalas. Curiously, The Cat From Outer Space features an almost identical climax, minus Savalas, but plus a telekinetic alien cat. Both an ostensibly serious movie and a transparently silly one considered the implications of shadowy government forces practicing mass deception as they fumbled with cutting-edge science. And both films could only think to funnel their stories toward a climax that could appear in virtually any sort of thriller. But the familiarity didn’t alleviate the underlying anxiety, and a growing sense that what we’re told rarely matches what actually happens. Any fear that can pop up in a children’s movie featuring an alien cat doesn’t get put away that easily.